Transferred on loan from R.A.F. No.13 Group 06 September 19444. 20 October 1944 as "WAGTAIL" - accounts on 'Books of SANDERLING'. Independent command 01 November 1944, accounts remained on 'Books of SANDERLING'. 10 March 1946 to Care & Maintenance Status administered by R.N.A.S. Abbotsinch. Bombardment Spotting School. No.3 Barracuda Servicing Unit. Flag Officer Carrier Training Squadron. No. 772 Fleet Requirements Unit. Accommodation for disembarked squadrons. Accommodation for two R.A.F. Squadrons. 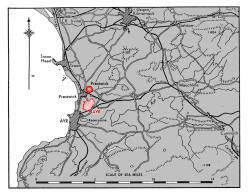 The airfield lies ¾ mile from the coast on the outskirts of Prestwick (NW,) and Ayr (SW.). Troon lies 4 miles NNW. and Glasgow 24 miles NNE. The town and harbour of Troon; the River Ayr, passing 1 mile S. of the airfield and entering the sea through the town of Ayr at a point 1½ miles SW. Ayr racecourse lies 1 mile SSW. and the large R.A.F. 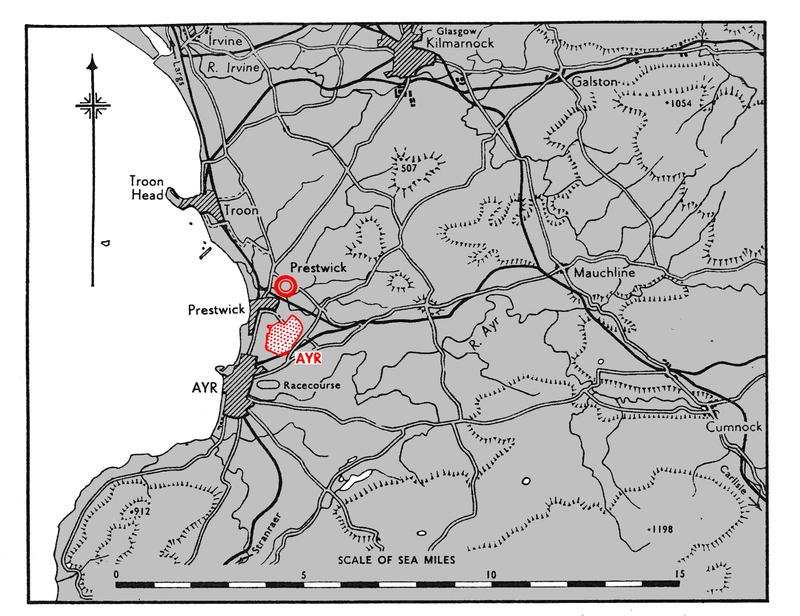 airfield of Prestwick 1¾ miles N.
Main toad to Ayr. about 2 miles (by road). Auchincriive station, ½ mile to E, (By road), and Ayr railway station. about 2½ miles SW. (By road). Connections to Kilmarnock and Mauchline for the main Glasgow - London line. Control Building SE. of intersection of runways 00/18 and 06/24, with full Type 1 flying control. Ground signals area NW. of Control building. 06/24 QDM. 065˚-245˚ .... 1,600 x 50 yds. 00/19 QDM. 004˚-184˚ .... 1,380 x50 yds. 13/31 QDM. 131˚-311˚ .... 1,200 x 50 yds. A 50 ft. tarmac perimeter track connects all runways. Grades and radii are poor in places. Taxi tracks and dispersal tracks to hard standings, hangars. etc., are 35 ft. wide. None. R.A.F. Prestwick retains flying control over all aircraft at Ayr. Chimneys, 200 frt., 1 mile S.
All clear, with exception of slight rising gradient at NW., end of runway 13/31. Windsock on E. side of landing area. 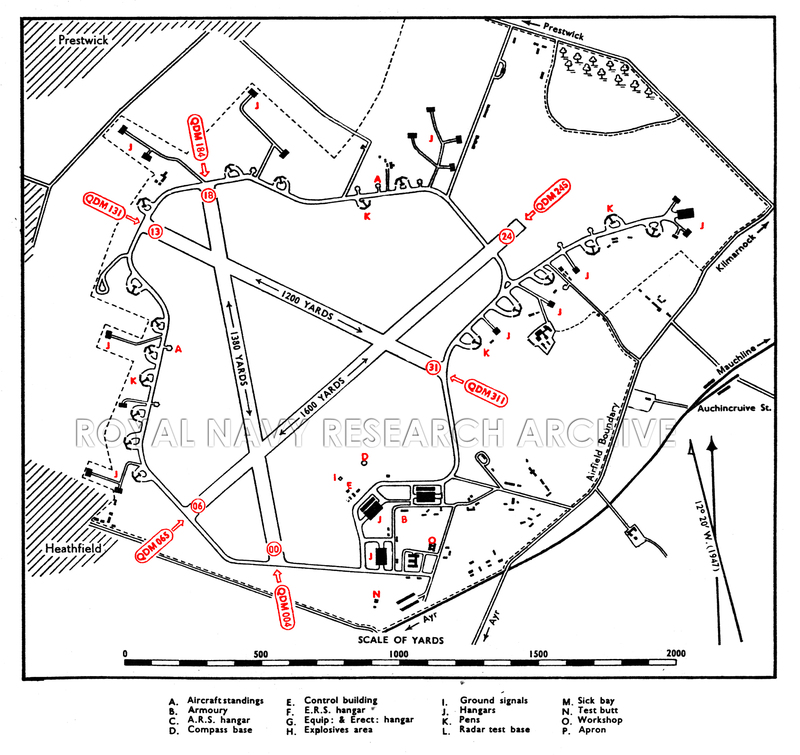 Drem Mark II airfield lighting; outer circle light shared with Prestwick. H/F provided on temporary basis. Living quarters in 'Lang' and 'Nissen' construction on 10 dispersed sites, 1,000/2,000 yds S. of the airfield. 16 double pens; 6 hard standings. Three hangars in workshop are. 1 R.A.F. Bellman in dispersed site NE of airfield. 17 Over blisters in squadron areas. 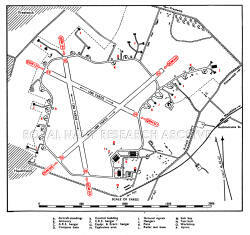 Two dispersed sick quarters approximately 1.500 yards S. of airfield. Full service available by Naval personnel. Two installations of 72,.000 and 36.000 gallons respectively. 2174/44 Naval Air Station, Ayr - Special Restrictions. 5846/44 R.N. Air Station, Ayr - Independent command. 2368/46 R.N. 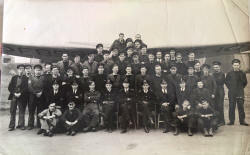 Air Station, Ayr (H.M.S. "Wagtail") - Reduction to Care and Maintenance. 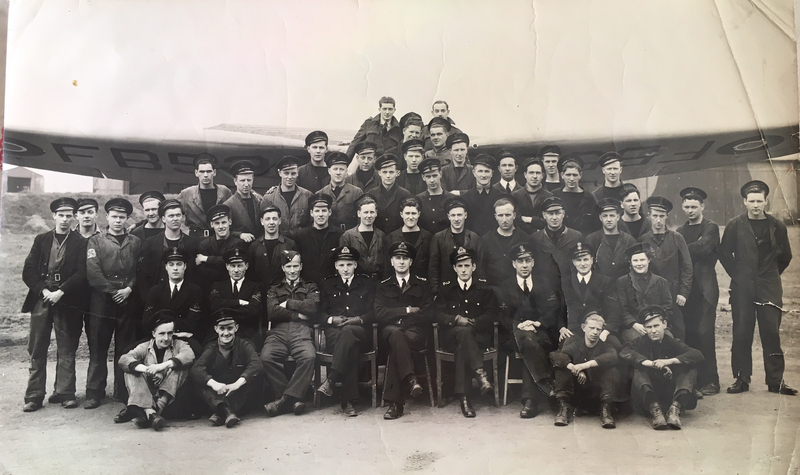 Station Flight personnel at RNAS Ayr with Stinson Reliant FB539 taken on April 13th 1945. 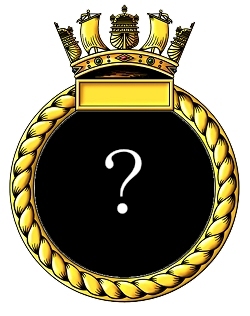 Sub-Lt M. A. Hastilow, Lt-Cdr. A.C. Mills, and Sub-Lt R.G. Dean are in the middle of the seated row. Photo courtesy of Mrs Bethany Jones, Sub-Lt Hastilow's granddaughter.